Although the MosquitoNet Project is small, for eight years we’ve been operating as volunteers with zero spent on overhead. We have managed to raise over $100,000 which translates into about 12,500 nets. Assuming that three or four people sleep under one family size net, this is equivalent to protection for at least 30,000 individuals. A young mother carries a baby and a mosquito net package on her head. The old expression “Good things come in small packages” could well be said about the Angola MosquitoNet Project. Firstly, the mosquito nets themselves are good things distributed in nice compact blue packages and secondly is the fact that compared to ambitious Africa-wide anti-malaria programs such as those sponsored by the United Nations, our initiative is tiny but good. Good because we catch the groups that fall in the cracks. These are groups or organizations headed by responsible people whom we know personally who are working in the hinterland of Angola as well as the ghettos inside the sprawling capital of Luanda but don’t qualify for or don’t have the logistical back-up or time to apply for mosquito nets from the big agencies. Take for example Joan Woodyer, a British registered nurse working in the province of Zaire. Joan works in a clinic run by the Baptist Church in the province’s capital city, M’banza Conga. When she heard of the MosquitoNet Project she contacted us. We gave her church in Luanda 400 nets which they promptly shipped up to Joan. 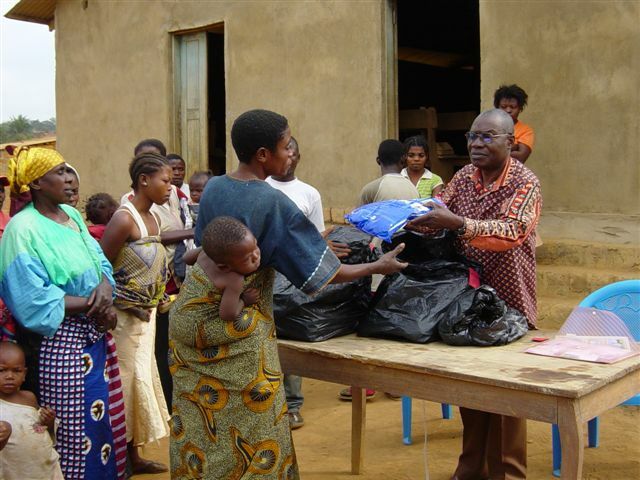 Mr. Kuku of the Baptist Church in Zaire Province distributes nets in the town of Sumpi. Our project’s goal is to raise enough funds to purchase 3,300 nets by the end of 2008. We definitely plan to have 400 small but good packages of nets to give to Joan for the villages in Zaire province.